An Old Telugu man with a long beard, an iron pot and chopper for cutting wood made his abode in the Draupadi temple. He would beg some food in the town, boil something or other in his iron pot on a small fire of wood cut with his chopper and eat it during the day. For hours together he could be seen standing and looking at Bhagavan. He would spend the night in the temple, which was dilapidated and abandoned and surrounded by jungle. Once the writer of this piece found him standing all alone in front of the temple and gazing at Arunachala. "I sleep here", he said when the writer asked him what he was doing in the forsaken temple. "What, sleeping here all alone , Are you not afraid," Exclaimed Chalam. The old man seemed indignant. Afraid of what, Bhagavan throws his light upon me. All through the night I am surrounded by a blue raidance. As long as his light is with me, how can I be afraid," The incident made Chalam deepply humble. Bhagavan's love and light was given in full measure to a poor old beggar, while those who pride themselves on being his chosen disciples are left high and dry because they have thelsemves to attend to. dry myself with the towel, and then put it out to dry. I used to guard it carefully so that no one else would know about it. Governor. He has asked me to get it from you. Please give it to me.â€™ So saying he mischievously stretched out his hand. you! We could not find out even this.â€™ So saying, they brought several bundles of towels. passed like that. What do we need? Such were those days!â€� said Bhagavan. Thannaiye kovanamai chatithanan kAn chAzhalo! He is wearing torn koupina. But it is worn with four Vedas, all arts and Space as the cross thread. Once during a visit to the Ashram in the 1940s I was sitting outside the Old Hall with many devotees, facing Sri Bhagavan who was reclining on a couch. A group of learned pundits were discussing certain passages from the Upanishads with great enthusiasm and profundity. All, including Bhagavan, appeared to be attentively listening to this interesting discussion when, all of a sudden, Bhagavan rose from his couch, walked thirty meters to the north, and stood before a villager who was standing there looking lowly with palms joined. Immediately the discussion stopped and all eyes were turned to Bhagavan and the villager standing at a distance. They appeared to be conversing, but at such a distance no one could tell about what. Soon Bhagavan returned to his couch and the discussion resumed. I was curious about this villager and why Bhagavan had gone out of his way to meet him. So, while the discussion continued I slipped away and caught up with him before he left the Ashram. I asked the villager what he and Bhagavan had talked about. He said that Bhagavan had asked him why he was standing there so far away. "I told Bhagavan, 'I am only an ignorant, poor villager. How am I to approach you who are God incarnate?'" "What did the Maharshi say then?" I asked. "He asked me my name, what village I was from, what work I did and how many children I had, etc." "Did you ask Him anything?" "I asked Him how I could be saved and how I could earn His blessings." "He asked me if there was a temple in my village. I told him there was. He wanted to know the name of the deity of that temple. I told Him the name. He then said that I should go on repeating the name of that deity and I would receive all the blessings needed." I came back to Bhagavan's presence and sat among the devotees listening to the learned discussion, in which I had now lost all interest, realizing that the simple humility and devotion of this peasant had evoked a far greater response from our Master than any amount of learning. I then decided that, though a scholar by profession, I should always remain a humble, ignorant peasant at heart, and pray, like that villager, for Bhagavan's grace and blessings. A Guru can do miracles by a mere gaze. Wolter Kiers did not speak a word with Him. He spent just two days with Him. He got the way to liberation. carts were going in the front. From them, from out of a torn gunny bag, these nuts were falling one by one. I picked them up. was quite happy and prostrated before Sri Bhagavan and took his lunch and left. You know what I want. You confer me whatever I want in full. Even that is Your Grace and wish! coming under the same thread? This following incident is like Lord Krishna's dictum in the gItA! One day, I asked Bhagavan humourously, how he was able to receive the thousands of prostrations made before him everyday. Bhagavan relied, "I shall tell you a secret of it. I prostrate to them before they prostrate to me. Those that come to me only throw the body on the ground as a sign of their humiliy. That contents of the mind may not be equally good. Whatever the contents of the mind may be, when I look at them, I look not into the mind but into the chaitanya there, that is, the Atman, which is my Self and of which they are not aware. I am one with them while they are noti aware of it, that is, the kulasthA and brahman are inseparable. To me there are no others. I alone am. The further implication of this is that while they think that they are prostrating, they are not doing the real prostration (pranIdAnA). On the other hand, while I do not physically bow my eka bhAvA helps them in every way. Thus is all souls I am the kulasthA, and I see my own Being in all of them, so I can accept not some thousands of prostrations but any number of them. I am all of them, while they don't know that they are Myself. 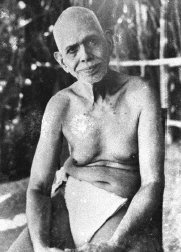 In 1942, Bhagavan was near the back steps of the Asramam when he abruptly threw his stick before the path of a dog, which was in hot pursuit of a squirrel. In this successful attempt to save the squirrel, he lost his balance and fell, fracturing his right shoulder. Soon after this incident, when I was taking leave of Bhagavan to visit my village, I looked at the bandaged shoulder and wanted to ask him how he was feeling. But how could I? I knew perfectly well that his reaction would be to question regarding his physical well being. It is improper to make inquiries about the health and welfare of those whose sole delight is in the Self, since they are strangers to those mental states, which distinguish betwee weal and woe. bhavatsu kushalaprashna AtmArAmEShu nEShyatE . kushalAkushalA yatra na santi mativRuttayah .. In regard to personages like you, who are ever immersed in the bliss of the Self, it is not proper to enquire about health, welfare, etc. For in their minds there are no mental midifications of pleasure and pain, enjoyments and sufferings. not raze me. I razed the knife! muruganAr's wife, mInAkshi ammAl, was a frequent visitor to the Ashramam. bhagavAn was especially kind and considerate to this lady, and treated her as a favoured guest. Knowing that mInAkshi ammAl loved good coffee, bhagavAn would tell the Ashramam cooks, "Give mInAkshi good, strong coffee, just the way she likes it." bhagavaAn would also listen patiently to mInAkshi ammAl's complaints about her husband, the chief among those being, of course, that muruganAr was neglecting her and all his domestic responsibilities. On one of her visits, mInAkshi ammAlseemed particularly upset. She told bhagavAn that muruganAr's neglect was very difficult for her to bear, and that muruganAr seemed not to realise just how badly his behavious was affecting her. It was mInAkshi ammAl's practice to sing few verses from muruganAr's ramaNa sannidhi murai in bhagavAn's presence, every time she came to Ashramam. On this occasion also, she had a copy of the book with her, and was about to select some suitable chapter. bhagavAn took the book from er hands and, marking the section where there was a decad of verses, each ending with 'ramaNA mAyavanE', he said to mInAkshi ammAl, "Look, mInAkshi! muruganAr will soon be returning from palakkOttu. As soon as he enters the hall, you must start singing these verses. But remember one thing! Each of these verses ends with the phrase, 'ramaNA mAyavanE'. You must substitute 'murugA mAyavanE' for 'ramaNA mAyavanE' when you sing. Is that clear? Now, taje your place and get ready, for muruganAr will be here soon." mInAkshi ammAlwas a simple soul, and her faith in bhagavAn was total. So she agreed to do exactly as bhagavAn said, even though she had not idea why he should want her to do it. Now, the verses selected by bhagavAn were very well suited to the occasion because they presented the picture of a love-lorn lady chiding her lover for his cruel neglect. In these verses, muruganAr portrays himself as a love-lorn lady and entreats bhagavAn to favour him with his grace. To be precise, the lady described the happy times she had shared with her Lord, and promises that he had made to her. Having won her with sweet words of love and assurances of undying devotion, her Lord had left her to dream about him and to wait eagerly for the time when he would come to claim her; but he had not come back. The lady chides her lover for his shameful neglect, and asks him what she had done, to deserve such cruel treatment from him. She bemoans her fate, regretting the fact that she had lost her heart to one so inconsistent, beguiled by his charm and his false promises. Each of the verses ends with the phrase, 'ramaNA mAyanE', (the term 'mAyavan' can be translated as 'the great deluder'). The lady is accusing her lover of misleading her with false promises. Yet, her langiage is far from abusive. In fact, her words are full of affection and reflect the remembered joy of happier times. Each of the poems in this section is exquisite in the beauty of expression and the delicacy of feeling. As soon as muruganAr entered the hall, mInAkshi ammAl started singing the songs selected by bhagavAn. Following bhagavAn's instructions faithfully, she ended each verse with 'murugA mAyavanE' instead of the original 'ramaNA mAyavanE'. The first time, muruganAr did not attach much importance to the substitution. Many devotees simply assumed that mInAkshi ammAl was making a reference to this aspect of bhagavAn's multi-faceted glory. When mInAkshi ammAlcame to the end of the second verse and there was still no response from muruganAr, bhagavAn glanced at him with eyes full of mischief. Then he directed a look of approval and encouragement at mInAkshi ammAl. Suddenly, muruganAr realised that some conspiracy was at work! By then, mInAkshi ammAl had ended the third verse also with 'murugA mAyavnE'. This repeated substitution of 'murugA mAyavanE' for 'ramaNA mAyavanE' now appeared highly significant to muruganAr. He was finally convinced that bhagavAn was deliberatley teasing him, using mInAkshi ammAl as an innocent, yet effective agent! muruganAr could think of only one couse of action - to leave the hall. Accordingly, he got up and was preparing to quietly slip out of the hall when bhagavAn stopped him with, "Hey! Why are you leaving the hall now? Is it not because she sang about her 'murugA mAyavan'? Well, does that mean that, whenever somebody sings about 'ramaNA mAyavan', I should immediately walk out of the hall? Is that not so?" Hearing bhagavAn's words, the entire hall dissolved in laughter. muruganAr made use of this diversion to make good his escape! bhagavAn often played such practical jokes upon his devotees. But even while he was engaged in such apparently playful activities, bhagavAn continued to impart valuable knowledge to his devotees. Every joke and every little trick had its own lesson to teach. Raghavachariar was coming to Maharshi off and on. His wife and mother feared that he might give up his social duties and become a recluse. They went to the Maharshi and told him their fear. The Maharshi consequently admonished Raghavachariar about the dangers of becoming a recluse without the severe training required for it. The Maharshi was giving similar advice to numerous others also. One evening, a female monkey entered the hall. A baby was hugging her belly. capable of! We talk about our reverence for those who have renounced the world. Bhagavan the looked at the monkey and beckoned her in soft and gentle tones. fruits and the monkey went away happily. Once when we were playing football, Venkataraman, while defending against the attacks of the opposing players, received a severe knock on his right leg, which immediately got swollen. He was frightened and had to return home and I carried him to a hospital and had some medicine applied and brought his leg to normal condition. He was very happy and thanked me for the timely help.